In the world of flower bulbs, tulips, daffodils, and hyacinths get all the love but, don’t forget about show-stopping Allium. Also know as ornamental onions, Alliums are easy to grow and come in a variety of shapes and sizes. The Growing Place has a selection of Allium bulbs which can be planted now and until the ground freezes. You’ll thank us next June when their ball-shaped flowers appear. Allium bulbs bloom in the landscape add drama and color through the mid-summer, starting when early spring perennials and bulbs are fading. Most Alliums produce striking spherical blooms made up of hundreds of individual flowers supported on sturdy thin stalks. They are dependably perennial and pest free in our area. Hummingbirds, bees, and butterflies are attracted to Allium blooms, but due to their onion flavor, they are unappetizing to both rodents and deer. Some gardeners report Alliums deter critters if inter-planted with tulips or other perennials. Some varieties produce flower heads as large as softballs held atop four-foot tall stems. Allium flowers, available in white, yellow, blue and purple, can be cut fresh for bouquets or dried to use in floral arrangements. (A word of warning–although beautiful, fresh cut Alliums will smell like onions.) You can also leave the spent flower heads up to lend a little drama to the garden. 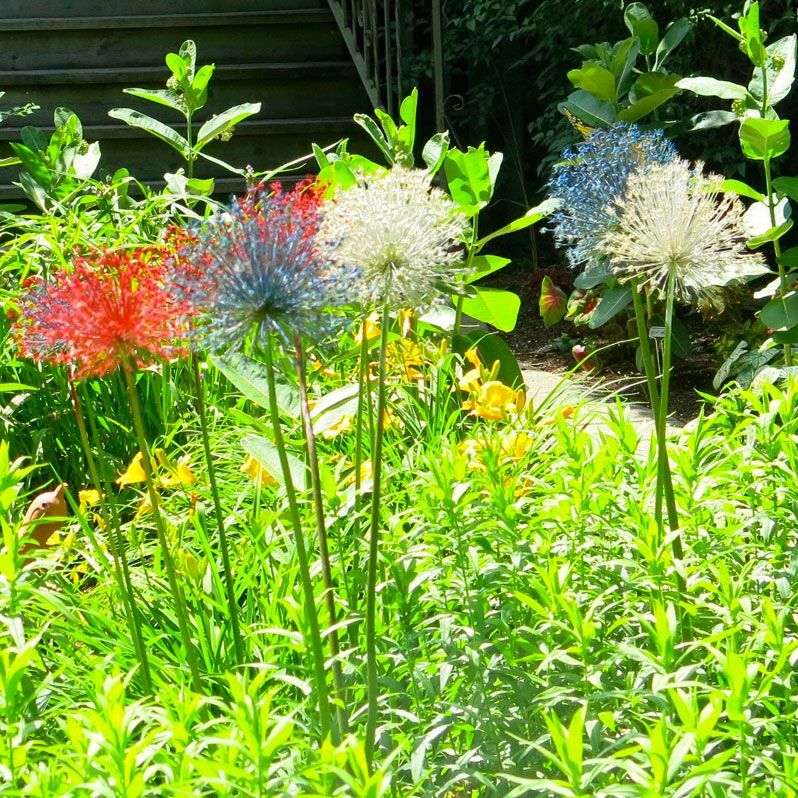 One gardener spray painted her dried A. giganteum flower heads red, white and blue for a July 4th garden party. They looked like fireworks! • Allium giganteum – the tallest Allium available, flower stalks may reach a height of 60” bearing purple, globe-shaped, softball-size flowers. Provide dramatic color as spring bulbs are fading and summer perennials are getting started. • Allium ‘Purple Sensation’ – purple, globe-shaped blooms are two to four inches in diameter on 24” to 30” stalks. Alliums are versatile in the landscape and can be grouped to serve as spectacular focal points or planted as dramatic borders, but in any case look great when planted with other summer-blooming perennials such as Hosta, Iris, Geum, and Roses. 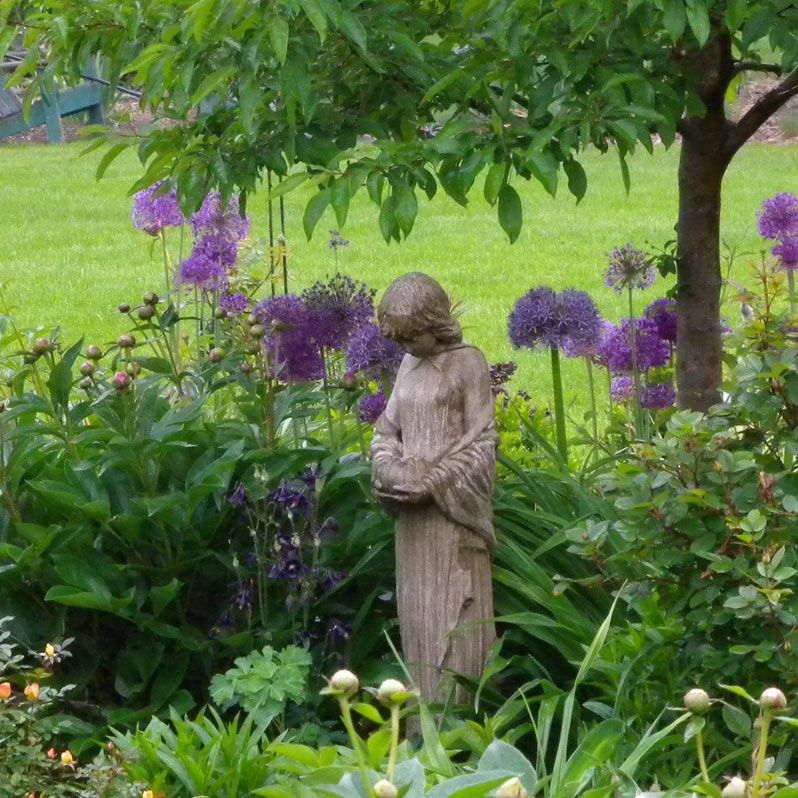 Planting Allium is no different than planting any other spring bulb. They grow best in part to full sun and in well-drained soil. Consider planting them in odd-numbered groups for maximum impact. Plant to a depth that is three times the diameter of the bulb—roots down and pointy side up. So, for example, plant a three-inch bulb nine inches beneath the surface. Alliums grow vertically, so plant small bulbs four to six inches apart, and larger bulbs six to eight inches apart. Water well to settle the bulbs into the ground. In the mid-summer, after plants have finished blooming leave the foliage in place until it yellows and dies-back. If leaves pull out easily then it’s time to remove them; otherwise; wait another week or two and try again. This is necessary because the leaves channel nutrients to the bulbs to power next year’s blooms. There are also several varieties of perennial Allium. They differ from the fall planted bulbs because their neat strap-like foliage does not yellow and wither away. The leaves stay bright green and tidy through our Chicagoland summers right up until heavy frost. Flowering starts when the summer becomes warmer, usually in July. Next spring we will carry 3 varieties. The taller varieties (height, 18-24″) Allium ‘Summer Beauty’ has lavender flowers, while A. ‘Millenium’ is more pink. The smaller variety (height: 6-12″) A. ‘Peek-a-Boo’ was found locally in St. Charles. It is a petite form of ‘Millenium’, which is named for and planted in Millenium Park in Chicago. Look for our perennial Allium collection in spring. Don’t put off planting spring bulbs and amazing Alliums now and look for the Perennial varieties in spring.